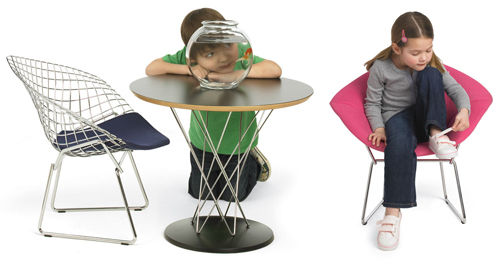 But I do have enough energy to tell you that last month Knoll introduced it's kiddo line. How exciting, Oui? For about a grand less than pop pop, little junior can start to hone his interior design chops while simultaneously mastering the art of staying within the lines. Let's see what else Knolz-e-bear (my term) has to offer. What child doesn't dream of owning her own Barcelona chair and ottoman? I'm serious, you know all of you decorophiles would have set your best friend's hair on fire for a set. I would have considered it but most likely I would have turned around and traded in the chair in for a zerox copy machine (my true heart's desire circa 1984, ask my mom, it's true). So if your little baby princess got 4 gold stars at daycare and you want to show her that you are the best mommy in America, check out the knoll goodies HERE.